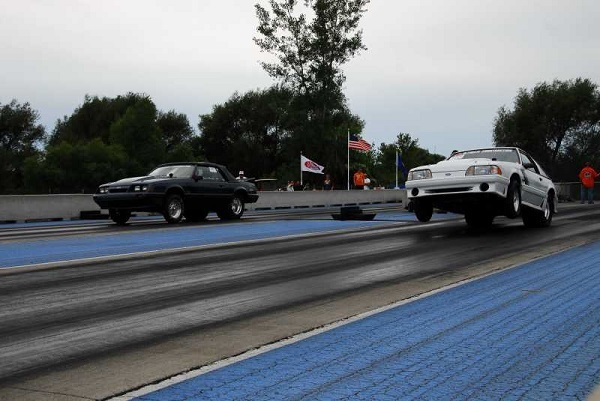 The NHRA Summit Racing Series features a bracket racing format that allows drivers in many types of vehicles, including dragsters, roadsters, sedans, coupes, trucks, bikes and snowmobiles to compete on an equal basis against each other. Grove Creek offers money and trophy classes from the beginner to the pro (age 16 and older)! NO MINIMUM CAR COUNT, GUARANTEED P/O! Money Eliminator - Win 2 Rounds, Win $$$! $1000 to WIN - Both Classes, Every Regular Race - No Combo Race! Trophy Eliminator - Win 2 Rounds, Win a Trophy! 'Non-Gizmo' competitors who are knocked out of competition early, can pay an extra fee and get into this additional round-robin race run near the end of the day. For Gizmo and Non-Gizmo Racers. 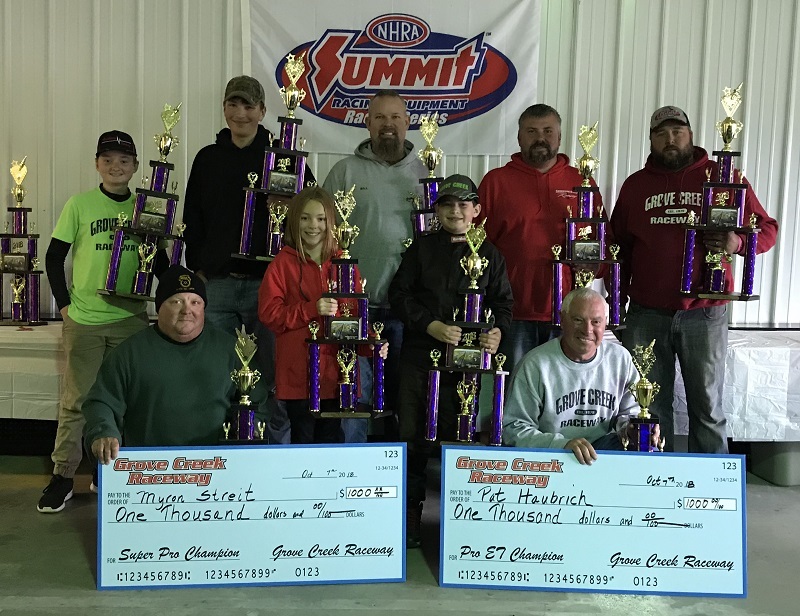 To Qualify to compete at the prestigious NHRA Summit Racing Series ET Finals, or win jackets, cash and prizes, you must join the Grove Creek Championship Series. Held at - Grove Creek Raceway - Grove City MN - See poster below for more details! NEW for 2019 it's the 10K at the CREEK! For the first time ever the winners of the Super Pro and Pro ET categories will battle it out for $10,000 Saturday night and $5,000 on Sunday! Do not miss this one - who will be our first 10K Winner? The 'Holiday Classics' are 3 double header race weekends featuring all our regular classes with Super Pro and Pro ET battling it out for the $2500 Prize both Saturday Night and Sunday! 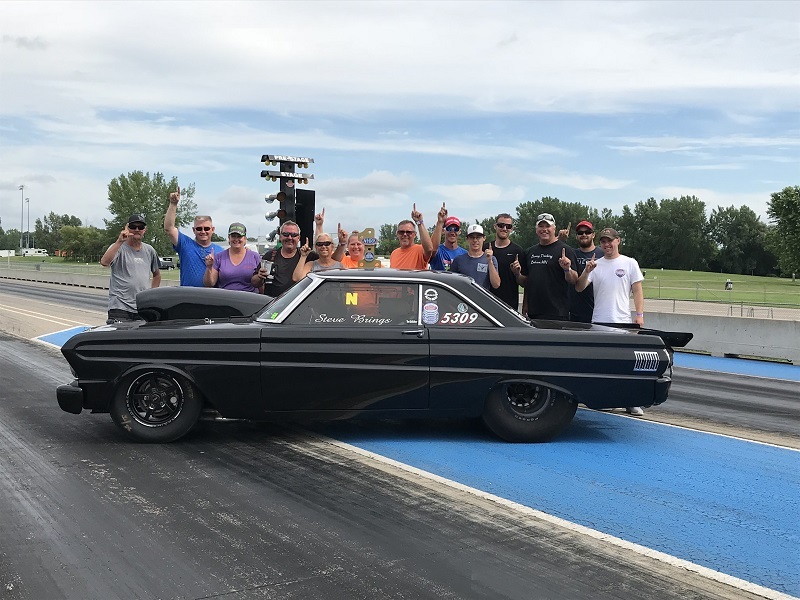 2018 MADNESS Winner Steve Brings in his '64 Falcon Steve makes this 2 in a row! All class winners from this day's event (including Super Quick) will compete head to head with dials to be declared the 'MADNESS' Champion. The winner will earn a custom trophy as well as 2 single-day vouchers to ANY NHRA Mello Yello Drag Racing Series event! 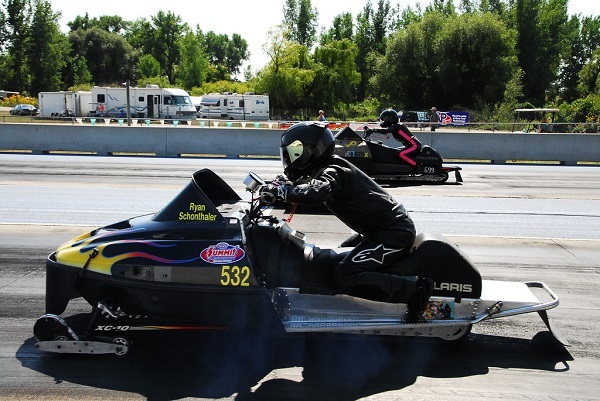 NHRA presents its NHRA.TV Challenge (formerly known as All Access Challenge) for E.T. bracket racers at NHRA member tracks. The winner of each catagory is rewarded with a special-edition pewter Wally trophy (the most coveted prize in drag racing) and an NHRA.TV hat. 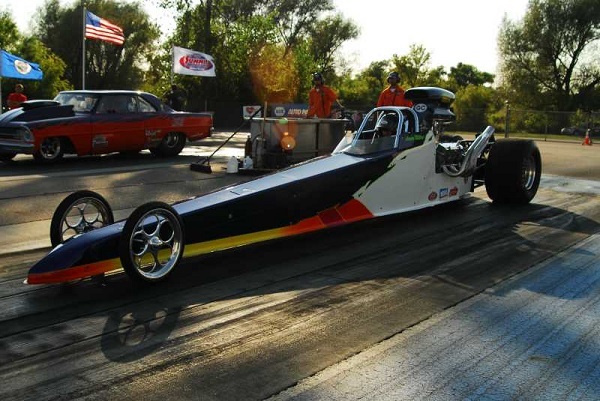 In addition, a picture of the winners will be printed in the National DRAGSTER. 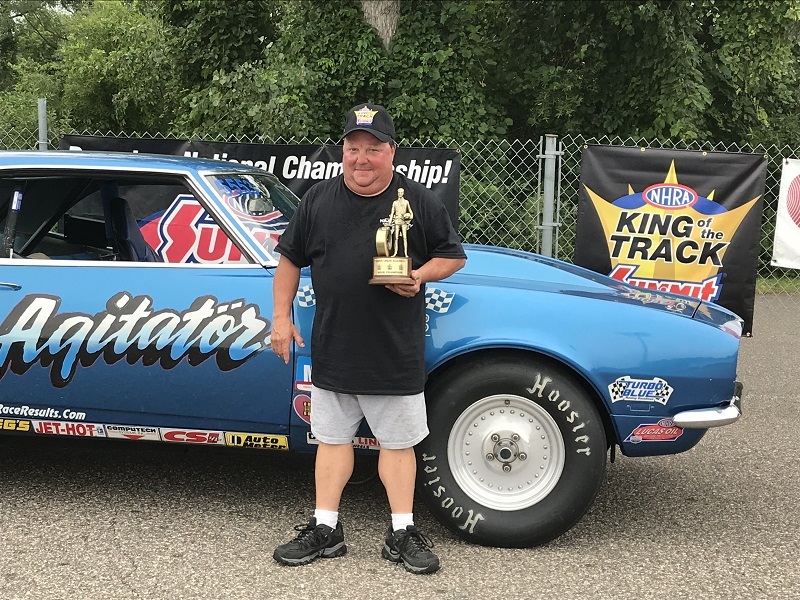 2018 King of the Track Winner Myron Streit in his 68 Chev Camaro! All class winners from this day's event (including Super Quick) will compete head to head with dials to become the King of the Track	Champion, who will receive a coveted NHRA Wally and King of the Track hat. In addition, the winner's picture, will be printed in National DRAGSTER. To participate in this event you must be registered in our GCR Championship Series (points program) and have run at least 2 points events in the season (see schedule for points events). **PLEASE NOTE** All 'Race of Champions' for ET Finals will come out of the Super Pro and Pro ET Classes. 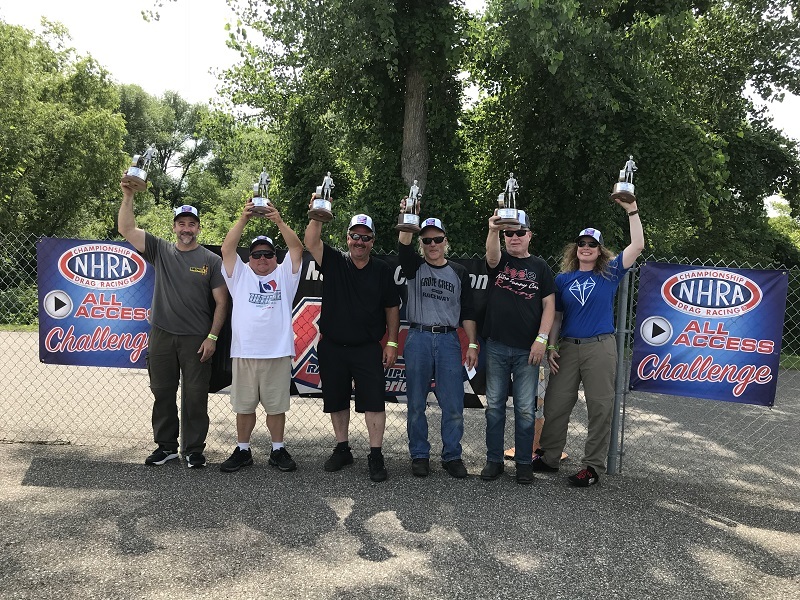 Division champions in Super Pro, Pro, Sportsman, and Motorcycle receive a division champion's trophy, jacket, and purse. They then advance to the NHRA Summit Racing Series National Championship at the season-ending Auto Club NHRA Finals in Pomona, where they receive $3,000 travel money for attending the event in California and compete for a lucrative Summit prize fund, the national championship trophy, and jacket and contingency awards. Be A Winner, Be A Member rewards NHRA members who win a race at an NHRA member track with prizes from sponsors. All submissions must be submitted online and meet the entry requirements outlined there. Become and NHRA Member and get a National Dragster subscription with spectacular action photography, in-depth features, and the sport's best racing coverage, every other weekend throughout the racing season (24 issues/yr), with discounts and more!